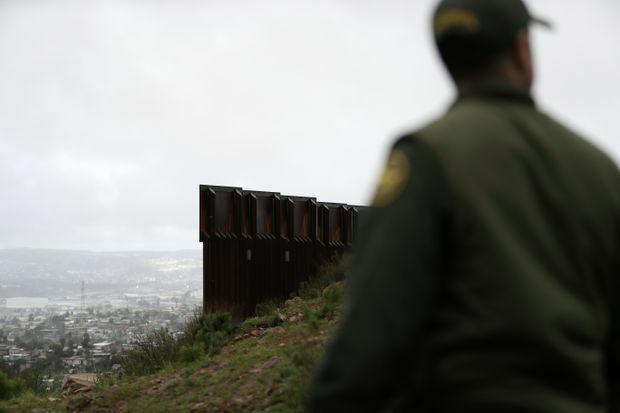 Border Patrol agent Vincent Pirro stands near where the border wall ends that separates Tijuana, Mexico, from San Diego, on Feb. 5, 2019. Republicans were desperate to avoid another bruising shutdown. They tentatively agreed to far less money for President Donald Trump’s border wall than the White House’s US$5.7-billion wish list, settling for a figure of nearly US$1.4-billion, according to congressional aides. That means 55 miles of new fencing – constructed through existing designs such as metal slats instead of a concrete wall – but far less than the 215 miles the White House demanded in December. The fencing would be built in the Rio Grande Valley in Texas. “We reached an agreement in principle,” said Senate Appropriations Committee Chairman Richard Shelby, appearing with a bipartisan group of House and Senate lawmakers who concurred. “With the government being shut down, the spectre of another shutdown this close, what brought us back together I thought tonight was we didn’t want that to happen” again, Shelby added. Details won’t be officially released until Tuesday, but the pact came in time to potentially alleviate any threat of a second partial government shutdown this weekend. Aides revealed the details under condition of anonymity because the agreement is tentative. It still must be signed by Trump to become law and he has not yet commented directly on whether he will do that.